The average cost of assisted living in Virginia Beach is $3,559 per month. This is higher than the national median of $3,346. Cheaper nearby regions include Hampton with an average starting cost of $2,544. To help you with your search, browse the 151 reviews below for assisted living facilities in Virginia Beach. On average, consumers rate assisted living in Virginia Beach 4.1 out of 5 stars. Better rated regions include Suffolk with an average rating of 4.5 out of 5 stars. Caring.com has helped 12 families in Virginia Beach find high-quality senior care. To speak with one of our Family Advisors about assisted living options and costs in Virginia Beach, call (855) 863-8283. There's plenty to see and do for residents of Virginia Beach, Virginia, including the 46,435 seniors who call the area home. With over 200 parks, a magnificent boardwalk, a sprawling beach, and a spectacular aquarium, it's the ideal location for seniors who enjoy being outdoors. There is also The Senior Source, a local television show that goes over the many programs and services available to seniors in the area. For seniors who can no longer complete daily activities independently, there are 16 assisted living facilities in the city. Assisted living facilities in Virginia Beach and the rest of Virginia are licensed through the Virginia Department of Social Services. Virginia Beach's cost of living is 115.6, 15 points higher than the national average of 100, which may be of concern to seniors with tight budgets. Virginia Beach's Hampton Roads Transit is a comprehensive public transportation system that has routes throughout the city. Seniors are offered reduced fare rates, and the company offers paratransit services to qualified individuals. Virginia partially taxes pensions and fully taxes retirement savings account income and social security benefits. Seniors who rely on benefits might find that living in Virginia Beach leaves them with less money for activities, care and transportation. The Virginia Beach area is home to world-class medical facilities, including Sentara Virginia Beach General Hospital and Sentara Heart Hospital, in the event of medical emergencies or illness. Virginia Beach has a violent crime rate of 10.2 and a property crime rate of 33.2, both lower than the national averages of 22.7 and 35.4, respectively. Seniors' families might feel assured that Virginia Beach is a safe place for seniors. Despite being famous for sunny beaches, Virginia Beach gets the full range of all four seasons. Summer highs reach 88 degrees, and winter lows drop down to 32. The area gets 47 inches of rain each year, and seven inches of snow annually. Families might want to ensure that facility rooms have air conditioning to keep seniors cool during sweltering conditions. Assisted Living costs in Virginia Beach start around $3,559 per month on average, while the nationwide average cost of assisted living is $4,000 per month, according to the latest figures from Genworth’s Cost of Care Survey. It’s important to note that assisted living rates in Virginia Beach and the surrounding suburbs can vary widely based on factors such as location, the level of care needed, apartment size and the types of amenities offered at each community. 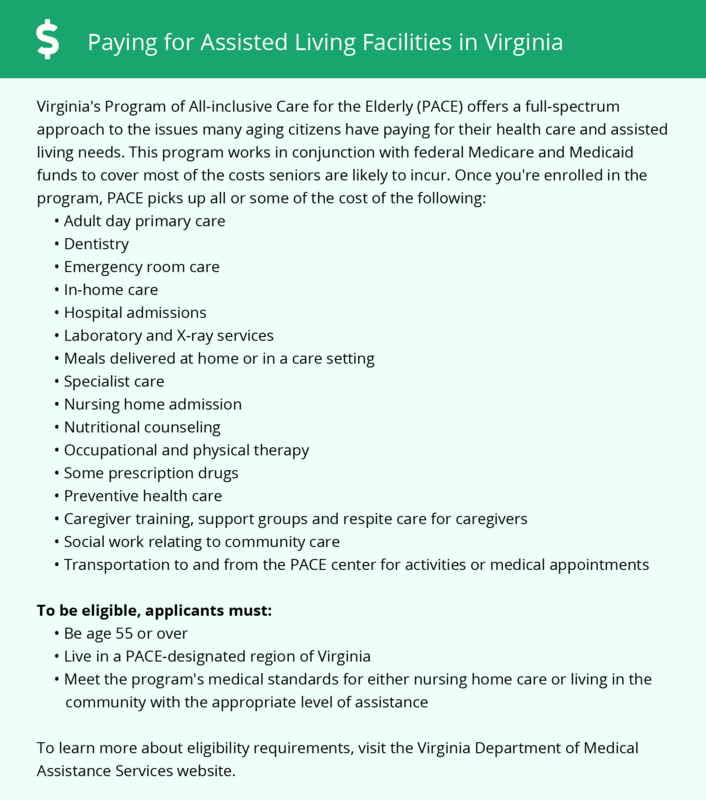 Virginia Beach seniors can seek financial assistance for services through the Commonwealth Coordinated Care Plus Medicaid Waiver. The state of Virginia also offers a program unrelated to Medicaid called the Auxiliary Grant. To see a list of free assisted living resources in Virginia Beach, please visit our Assisted Living in Virginia page. Virginia Beach-area assisted living communities must adhere to the comprehensive set of state laws and regulations that all assisted living communities in Virginia are required to follow. Visit our Assisted Living in Virginia page for more information about these laws.